“Scripture in the Church: Formative or Formality?” is the title of the 21st annual Theological Symposium, to be held Sept. 21-22 on the campus of Concordia Seminary, St. Louis. The main presenter for the event is Stephen Fowl, PhD, professor of theology at Loyola University, Maryland. His recent books include Engaging Scripture and Theological Interpretation of Scripture. Plenary presenters are Seminary professors Timothy Saleska and Joel Okamoto. Sectional presenters include Seminary faculty members Charles Arand, Paul Raabe, David Schmitt, Jeffrey Kloha, Timothy Saleska, and Gerhard Bode; and Mark Hoehner, Matthew Hoehner, Joel Lehenbauer, Robert Sundquist, and Peter Nafzger. Christians use the Bible as text for sermons, foundation for Bible studies, source for theological discourse, and basis for personal devotion. Many of them, including those in the LCMS, agree that the Scriptures are authoritative and infallible. Yet despite this consensus, we come to differing conclusions—and at times wildly varying positions—regarding what the Scriptures say and what teaching and practice we should draw from them. This raises several questions: If this is happening when we all read the same Bible and regard it as the authority for faith and life, is Scripture genuinely formative? If it is, how does that formation happen? Has Scripture become a mere formality in our teaching and life? 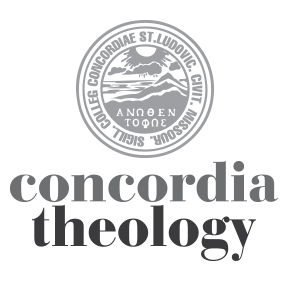 Immediately prior to the symposium, on September 20, is Concordia Seminary’s annual Day of Exegetical Reflection. This year’s Day of Exegetical Reflection promises to be a particularly special occasion. Noted evangelical scholar, D.A. Carson, will be with us to lecture on the proper interpretation of the parables of Jesus, and we’ll spend the day focused on and responding to his presentations. We hope that you will be able to come and share the day with us. You can find the schedule and registration details for the Day of Exegetical Reflection in the 21st Theological Symposium brochure. Donald A. Carson, PhD, is research professor of New Testament at Trinity Evangelical Divinity School in Deerfield, Ill. Dr. Carson’s areas of expertise include biblical theology, the historical Jesus, postmodernism, pluralism, Greek grammar, Johannine theology, Pauline theology, and questions of suffering and evil. Dr. Carson has written or edited more than 50 books. Those gathered for the symposium will have a “hands on” experience which allows for discussion and interaction on specific topics and with the presenters. Stephen Fowl will give a perspective on Scripture and the church from outside the Lutheran tradition. Two plenaries will describe the use of the Scripture within the LCMS: Joel Okamoto will speak on “Scriptures and their Uses,” and Timothy Saleska will focus on Interpretation in Communities. Joel Lehenbauer, executive director of the CTCR, and Charles Arand and Paul Raabe, both drafters of recently published documents, will discuss the use of Scripture in CTCR documents. Three new “study Bibles” will also be discussed, led by David Schmitt, Matthew Hoehner, and Mark Hoehner. Following the plenaries, participants will have opportunity to participate in faculty-led discussions of the presentations. Full registration is $130 per person ($140 after Sept. 7) and includes program materials, Tuesday’s buffet reception, and refreshments. Other registration fees come at ala carte pricing. Registration deadline is Sept. 10. For more information and/or registration information, contact the office of continuing education and parish services at 314-505-7486 or ce@csl.edu.